Consistent pumping of money by foreign institutional investors lifted the BSE benchmark index Sensex and broader NSE Nifty to their lifetime closing high of 22,095.30 and 6,601.40 points, respectively, today. Commerce and Industry Minister Anand Sharma today rejected the perception of crony capitalism in the economic environment and said the government has been taking action to deal with aberrations in the system. The Oil Ministry has summoned Reliance Industries (RIL) and consumers who use its KG-D6 gas for a meeting later this week to decide on extending sales contract beyond March 31.RIL's five-year contracts to sell eastern offshore KG-D6 gas to fertiliser units, LPG extraction plants and power stations end on March 31. Should market decide your asset allocation strategy? The Election Commission today said it will take a view on the issuance of new bank licences by the RBI on Monday. "I think most likely we will take up the issue on Monday," Election Commissioner HS Brahma said when asked if the EC had already taken a view on the request of RBI to allow the central bank to issue new bank licences. Petrol prices are likely to be cut by over one rupee a litre early next week as appreciation in value of rupee against US dollar and fall in global oil rates has made imports cheaper. 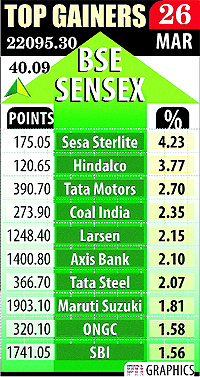 The 30-share Sensex opened on a strong note and rose to a historical peak of 22,172.10 points intra-day. It, however, lost some momentum and settled the day at 22,095.30, its record closing high, by gaining 40.09 points or 0.18%. The NSE Nifty, comprising 50 shares, firmed up by 11.65 points or 0.18% to close above 6,600 level for the first time at 6,601.40 points. The broader index touched intra-trade record high of 6,627.45 points. Foreign institutional investors (FIIs) bought shares worth Rs 1,223.28 crore, as per provisional data available with stock exchanges. Market experts said positive global cues and overall optimism boosted the buying sentiment. Short-covering ahead of the expiry of futures and options contracts tomorrow also helped to lift the indices to to their all-time high levels. Metal, capital goods, refinery and auto shares were in demand, while pharma, IT, tech and FMCG counters were at the receiving end. Jignesh Chaudhary, Head of Research, Veracity Broking Services, said: "Investor confidence got a much-needed boost from upbeat US data and diminishing concerns over the Ukraine/Crimea crisis. "Gains were also supported by strong buying by overseas investors, who bought Indian shares worth $3.5 billion into local shares and debt since March 1 amid easing inflation and forecasts for quickening growth, and ahead of national elections." This year Sensex traded strong and has increased 4.6%, the best performer among the four largest emerging markets, including China, Russia and Brazil, he added. In line with rising local equities, the rupee on Wednesday firmed up by 34 paise to close at 8-month high of 60.14 against the dollar on sustained capital inflows. Dollar selling by exporters and some banks also aided the rupee surge, a forex dealer said. At the Interbank Foreign Exchange (Forex) market, the domestic currency resumed strong at 60.28 a dollar from last close of 60.48. It improved to a high of 60.07 before settling at 60.14, rupee's highest closing since July 29, 2013, when it had concluded at 59.41. 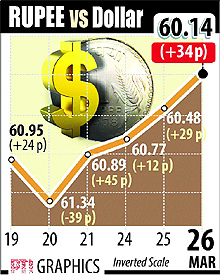 The local currency has gained 120 paise or 1.96% in four straight days of trading. Hitting out at political opponents for sensationalising corruption issues, Sharma said crony capitalism that appears to have hijacked the ongoing narrative is a wrong perception that cannot be sustained. "We have had corporate and bank frauds in all rich countries. It is a long list, we also have our list beginning with Satyam, the chit funds...or the latest in this role is the Sahara issue”, Sharma said while speaking at the annual session of the CII here today. He said the system has ensured accountability in such cases and the government has taken corrective action. He said many people are talking about crony capitalism and they have sensationalised in a manner that all the economic activities are part of that. "I am rejecting that, this is not true. This perception must not be sustained. Yes, there are issues which happen in other countries too", he added. Sharma also underlined the need for pushing judicial administrative and electoral reforms where a national corpus could be created for political parties to ensure transparency in the political process. He said while a lot is made out of scams, particularly in natural resources, the government is guided by the philosophy of welfare state where natural resources have to be shared and profit maximisation cannot be its objective. The company had proposed to sign new contracts with the users on revised higher gas prices that were to come into effect from April 1 but the move has been scuttled as the Election Commission on Monday asked the government to delay raising prices until the completion of elections. The Election Commission today said it will take a view on the issuance of new bank licences by the RBI on Monday. "I think most likely we will take up the issue on Monday," Election Commissioner HS Brahma said when asked if the EC had already taken a view on the request of RBI to allow the central bank to issue new bank licences. He said the RBI has already submitted clarifications sought by the Commission. "The letter (from RBI) has come to us... It came to us about a week ago. We have asked them to clarify certain points. They have clarified," he said. About two dozen public and private sector applicants, including India Post, IFCI and large business houses such as the Anil Ambani group and the Aditya Birla group, have applied for bank licences. On the concerns of Election Commission with regard to issuance of licence, Brahma said: "Our concern is simple, if you have done your job properly... if they are very confident about their rules and regulations, why should they refer to us? Point is that, if they have done their job thoroughly, honestly, diligently, they should not have referred." He further said if everything with regard to new bank licence were decided on 2013, then what prevented RBI from issuing them. However, diesel rates will go up by 50 paisa per litre in line with the practice of raising prices by small quantum every month to wipe away subsidy on the fuel. Oil firms are due to announce revised petrol and diesel prices on March 31.